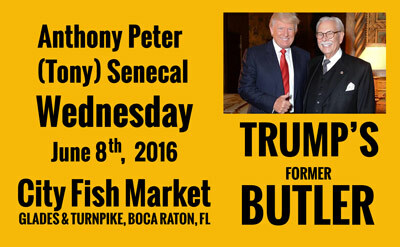 On Wednesday June 8th., 11:30 a.m., at City Fish Market in Boca Raton, Donald Trump’s Butler, Anthony Peter (Tony) Senecal, will be speaking to the Gold Coast Tiger Bay Club. He knows all the secrets. Anthony Peter Senecal was born on Oct. 29, 1931 in Plattsburgh, NY. When his parents died, he went to live with a second cousin in Arlington, Va., who was the Administrative Assistant to a Congressman. He worked on Capitol Hill while in High School, with two Congressmen who stopped and talked to him almost every day; Jerry Ford from Grand Rapids, MI and Harley O. Staggers from W. Va., who suggested he go to a Shepherd College, a little school nestled in the Shenandoah Valley. He drove up on Freshman Registration day, got in line and plunked down the $99 registration fee. Skipping ahead to 1959, he taught school for a few years, but was bored to tears as were a bunch of friends. About a dozen of them decided to quit their respective jobs and headed to Palm Beach, Florida where one friend knew a charter boat captain who took them to Cuba to fight with Fidel Castro against Batista. He was the only one to make it back to Palm Beach and looked for a job. 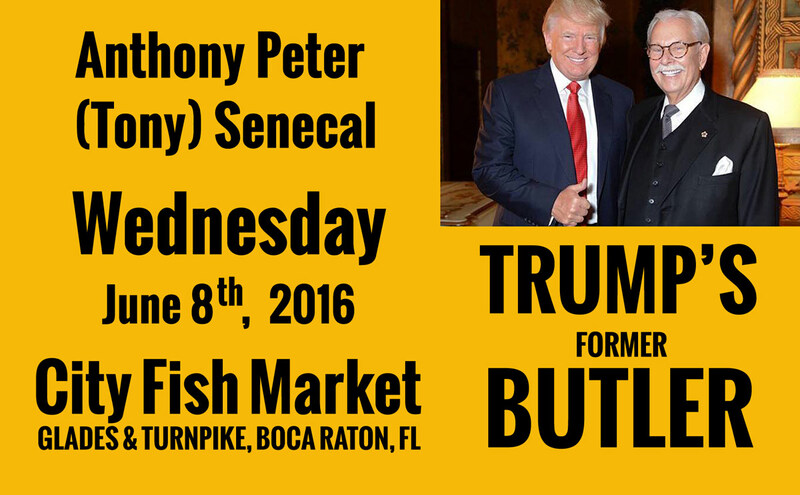 In 1985 he became a footman to Marjorie Merriweather Post and when she sold Mar-A-Lago to Donald Trump, he became Trump’s personal butler.